Family dinner time is sacred around our home. We sit up to dinner every single night together. Sometimes it’s rushed, rarely it’s out to eat, on the occasional Friday we make a picnic with pizza for our movie night. Around the dinner table is the only set time that we have to be together as a family–engaging in conversation that includes everyone. I aim to make meals around my kids pickiness because I want dinner time to be pleasant for all involved. I’ve got a few tricks up my sleeve to bring out conversation, but it’s mostly a happy time. As a momma, that’s all I want–happy. I’ve been trying to expand my cooking repertoire lately. The past three months we’ve had my husbands’ sister and her little family living with us. In exchange for room and board, she cooks dinner every other night, and it’s taken the monotony out of cooking for me. It’s been nice to have that little break, and I get more excited to experiment a little with new recipes. Enchiladas were a staple a round my house growing up. 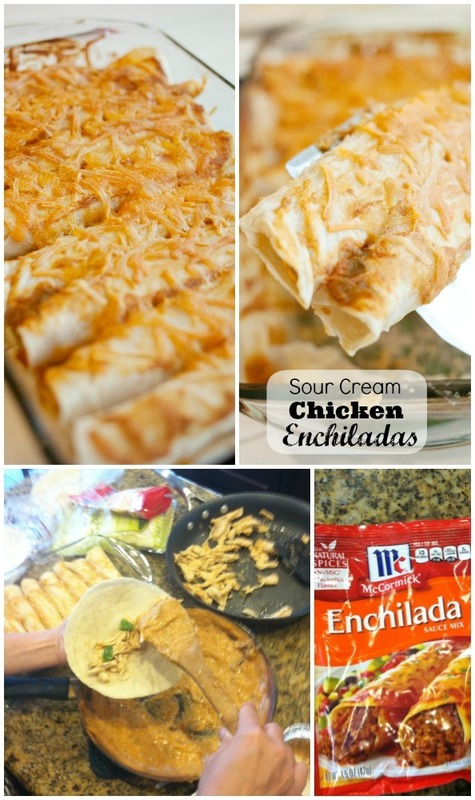 I shared a month or so ago our family favorite Quick and Easy Beef Enchiladas, which my kids currently love. I had a friend in high school whose mom made the most delicious creamy chicken enchiladas. I thought I’d try my hand at them for a little change. I got the recipe from the McCormick site, and used their recipe with the enchilada sauce mix packet. I’ve been compensated for this post to try out this recipe, but all opinions are my own. Using the McCormick seasoning really makes the recipe quick and painless. I had some issues with photographing this recipe, but they were REALLY delicious! I was worried my kids wouldn’t go for the green chili’s inside, but they weren’t detected–yipee!! Stir Sauce Mix and milk in medium saucepan. Stirring constantly, cook on medium heat 5 minutes or until thickened. Stir in sour cream and chiles; set aside. Heat 1 tablespoon of the oil in large skillet on medium heat. Add chicken; cook and stir 3 minutes or until lightly browned. Add remaining 1 tablespoon oil to skillet. Add onion and bell pepper; cook and stir 10 minutes or until tender. Return chicken to skillet. Stir in 1/2 cup of the sauce. Spread 1/2 cup of sauce in lightly greased 13x9-inch baking dish. Heat tortillas as directed on package. Divide the chicken mixture evenly among each tortilla. Fold over tortillas sides; place seam-side down in baking dish. Pour remaining sauce over enchiladas. Sprinkle with cheese. Bake 40 minutes or until heated through and cheese is melted. I made a quick instagram video showing my enchilada making setup, just to show how easy it is! Which do you prefer, red sauce with beef or creamy chicken enchiladas?? Which McCormick recipe are you interested in trying trying from McCormick.com?